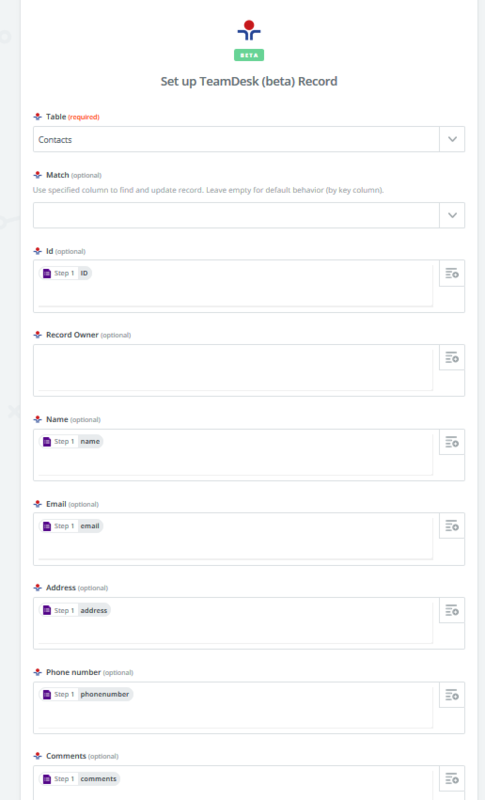 Now you can register contacts and tasks, trigger email campaigns, update CRMs and accounting software and more, all without writing a single line of code. 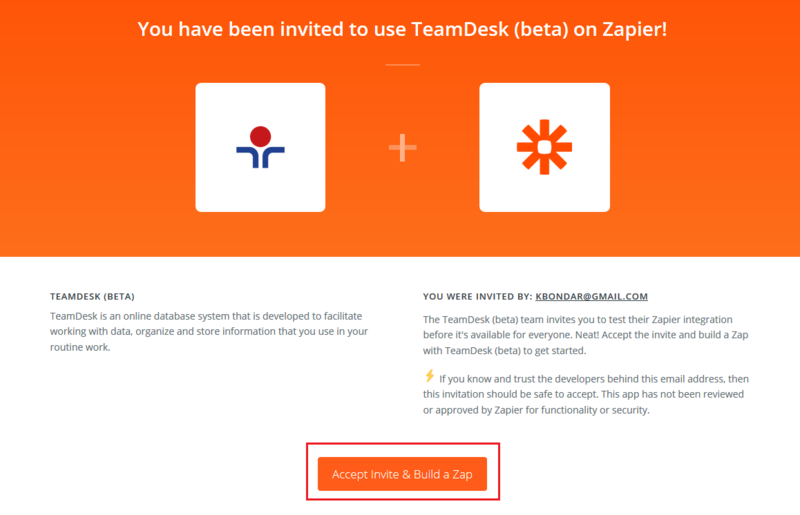 Currently TeamDesk (beta) on Zapier is available, therefore, for the smooth integration, you should precisely follow the steps described below. 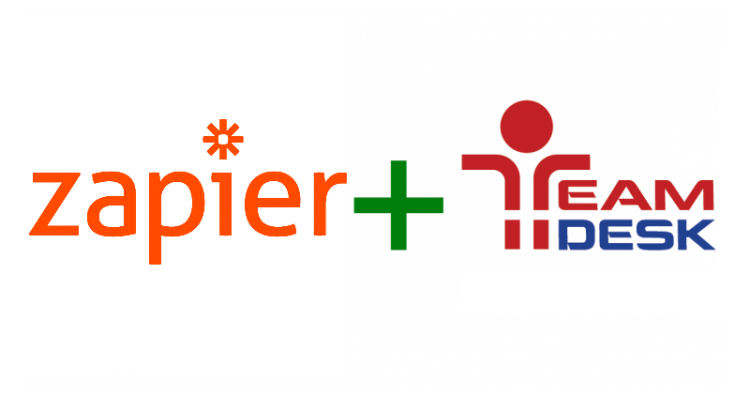 Let’s review Google Forms to TeamDesk connection via Zapier. 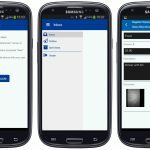 You need to store the data submitted via this form in your “Contact Management” online database built based on TeamDesk. So, when a customer submits the form, a new record should be created in the “Contacts” table. 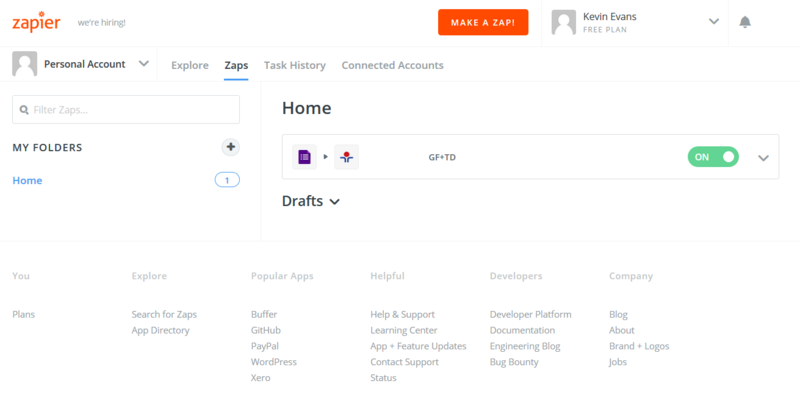 Click on the “Make a New Zap” button on the Dashboard. 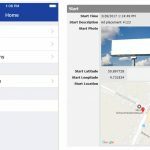 In our example, this new Zap should connect a “Google Forms” account to TeamDesk web-database. 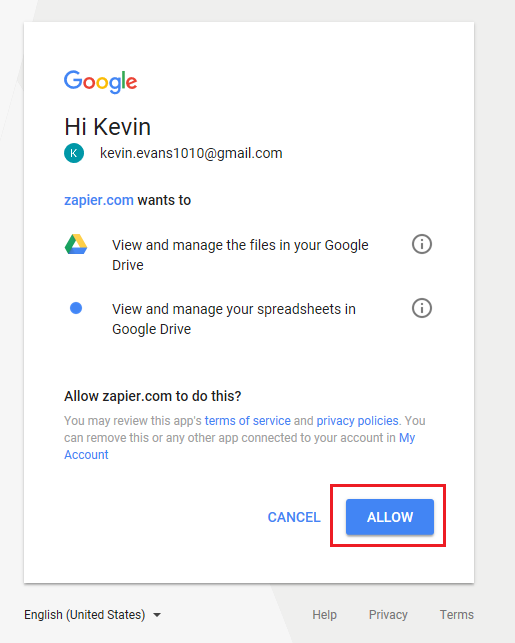 Therefore, the “Google Forms” app should be selected as a ‘trigger’ app in this zap. To save newly-created “Google Forms” records into TeamDesk database, select the “New Response” trigger option. Connect your “Google Forms” account to this trigger by clicking the “Connect a New Account” button. Select “Google Forms” account and allow the connection. The account is now connected to the trigger. Now you may select this spreadsheet from the Spreadsheet dropdown list and select a ‘worksheet’ from the ‘Worksheet’ dropdown list in the “Zap” settings. Press “Continue” button to save the changes. Pressing “Fetch & Continue” button will create the trigger. Click on the Continue button to proceed to the next step – creating an action. 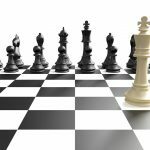 Creating an ‘action’ would be the next step. Begin with selecting “TeamDesk (beta)” as an ‘Action’ App. Then specify the action type, such as ‘Create’ or ‘Update’ records. 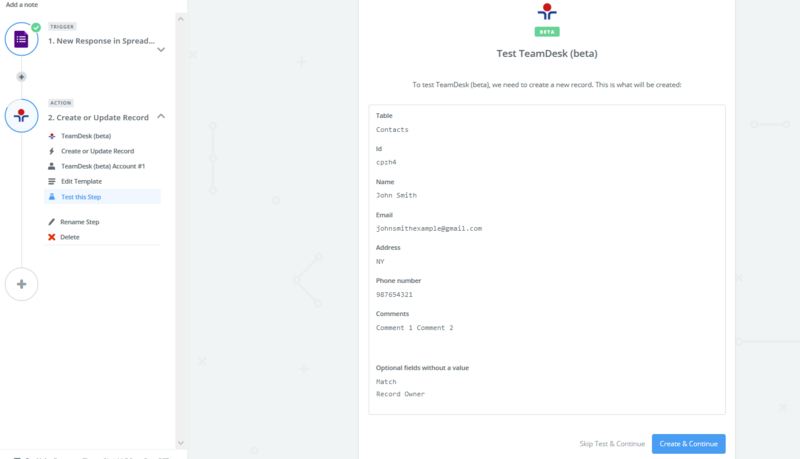 After that you’ll be able to connect your new TeamDesk account to the ‘action’ by pressing the “Connect a New account” button. 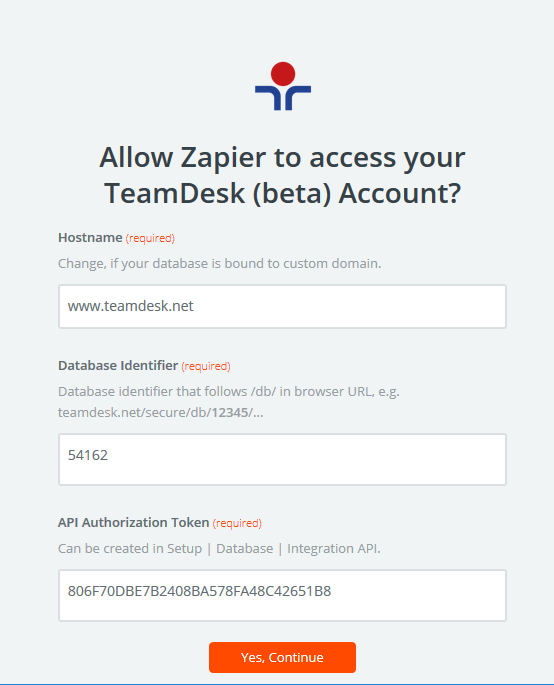 To get “API Authorization Token”, enter TeamDesk database Setup, select “Database” tab >>Tools>> Integration API. 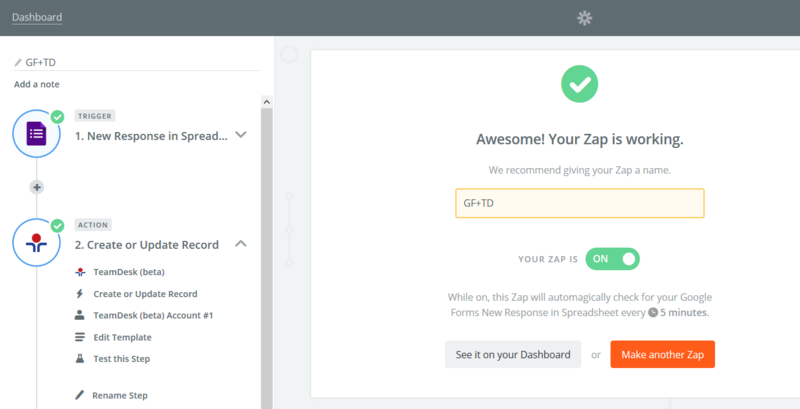 Generate the REST API Authorization Token, save changes and copy /paste this Token to your zap. 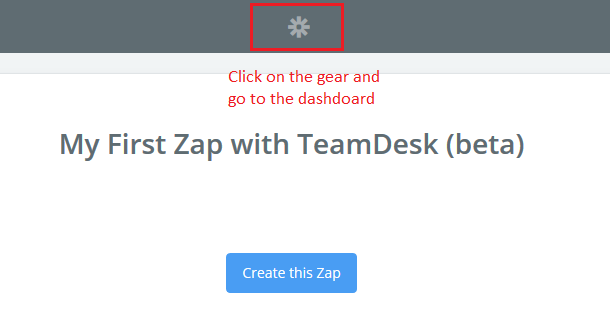 When TeamDesk database account got related to the Zap, you can proceed with the ‘action’ setup. To setup ‘TeamDesk record create action’ press “Save+Continue” button. 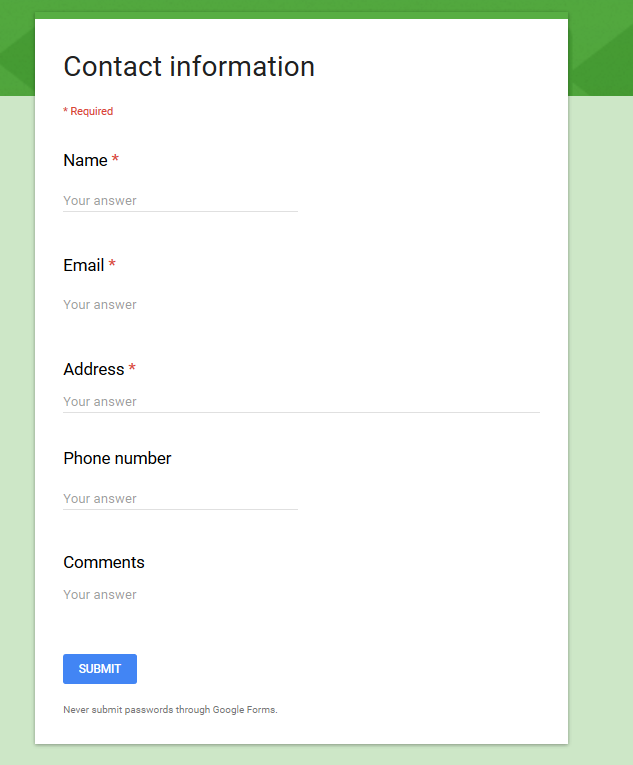 Select Google Forms’ columns containing data to be inserted into corresponding TeamDesk columns. Review the settings on the ‘preview’ page and press “Create & Continue button”. Give your Zap a name and turn it ON. 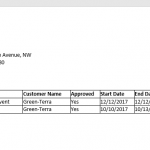 Now, when a client fills up a Google Form and submits, the record is created in your TeamDesk online database automatically.